Jami Gigot has always loved a good story. As a child she would secretly read by moonlight well past her bedtime. Passionately interested in the relationship between words and pictures she studied animation and VFX at Vancouver Film School and has worked as a Digital Artist on several films (including Avatar, Tim Burton's Charlie and the Chocolate Factory and Captain America). Though she hails from Madison, Wisconsin, she now calls Vancouver, BC home with her husband and two children, both of whom happen to be incredible moon spotters. This is Jami’s first picture book. Vancouver author-illustrator and visual-effects animator Jami Gigot’s debut picture book celebrates children’s fascination with the moon. Conveyed in minimal and lucid text, the story tells of a young girl’s affinity for the celestial body. The pigtailed protagonist, Mae, delights in playing games like hide-and-seek with the moon. As the nights elapse, she spies the moon growing thinner, waning to a crescent and then disappearing altogether. The following day, Mae crafts a rocket from a cardboard box and imagines herself boarding the vessel – dubbed the Moon Chaser – and embarking on a quest to find her luminous companion. When night falls and her father beckons her to come inside, Mae discovers the moon has returned. This sleepy-time tale unfolds against a backdrop of pencil and digital-paint artwork infused with twilight-evoking hues of black, purple, and blue. Gigot lends an innovative visual touch with the use of wordless spreads, which heighten the emotion of the story’s dramatic moments. The moon’s disappearance, depicted as two pages of black sky punctuated with white stars, is a striking example. Little Mae loves the moon, looking for it in the sky every night. She thinks of the orb as her playmate, as she tries to catch it, howls at it, or plays hide-and-seek with it in the park. As time goes by, Mae notices that the moon keeps getting thinner, until one night it disappears completely. 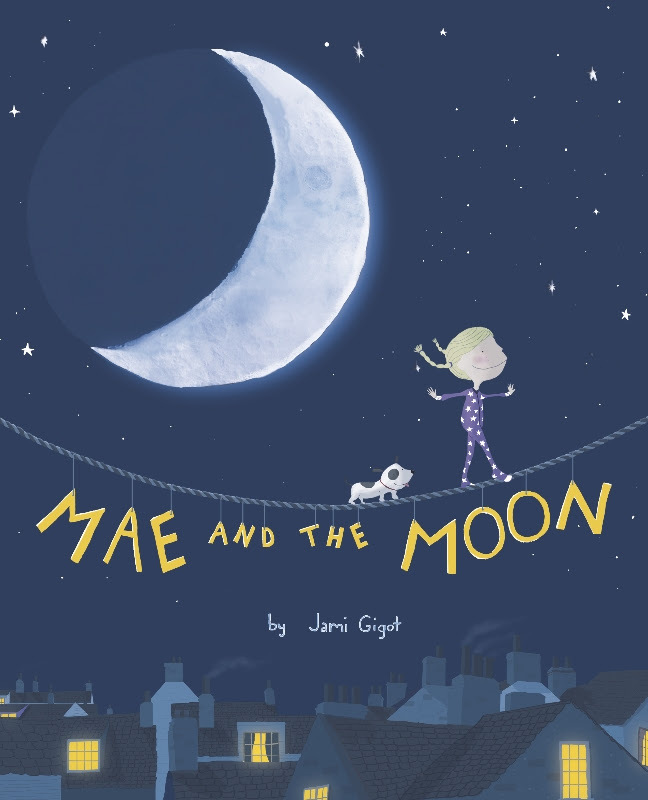 Devastated, Mae asks her mom if her friend will return, only to be told, “Even moons need to rest.” Not satisfied with this explanation, Mae and her dad build a cardboard rocket that reunites Mae and the moon...in her imagination. While Mae plays with the rocket, the real moon comes back; in the happy conclusion of the story, the moon’s thin crescent smiles through the window upon the sleeping Mae. Gigot’s digitally colored pencil illustrations perfectly capture the calm lunar glow over the nocturnal blues and purples of a sleepy town, setting up a stark contrast of darkness in the spread when the moon is absent. Their cartoonish style is sweetly humorous, especially in portraying Mae’s real companion—a little white dog. Front and back endpapers feature the phases of the moon.